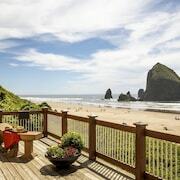 Situated near the beach, this hotel is within a 15-minute walk of Tolovana Beach State Park and Cannon Beach. Haystack Rock is 1 mi (1.6 km) away. 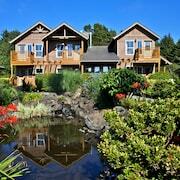 Situated by the ocean, this hotel is steps from Les Shirley Park and Cannon Beach. 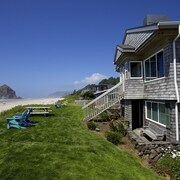 Ecola State Park and Haystack Rock are also within 2 mi (3 km). 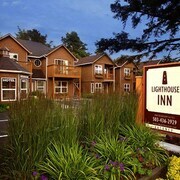 Located in Downtown Cannon Beach, this inn is within a 15-minute walk of Cannon Beach and Haystack Rock. Ecola State Park is 1.7 mi (2.7 km) away. We booked kind of at the last minute and were fortunate to find a room at the Hallmark. 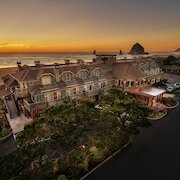 The location is excellent — this is the closest hotel to the famed Haystack Rock on the beach side. On the other side it’s close to the delightful Pelican Brewing, which has great beer and food, and to the Sleepy Monk, the best coffee shop in town. Our room was on the third floor, and there’s no elevator, so we definitely got our exercise. The Hallmark does not have a restaurant, but it does have a handy store off the lobby where free coffee is available all day. And don’t miss out on the chocolate chip cookies that magically appear at 4 p.m. in the lobby each day. The room itself was nothing fancy, but it was spacious and adequate for our needs. 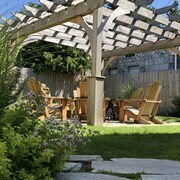 Centrally located so have a guaranteed parking space for downtown strolling but feel like in a quiet oasis from hustle and bustle. Room very comfortable and tasteful. Details such as wine opener, knife, cutting board and paper towels a big plus. 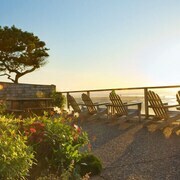 A wonderful get away for our anniversary. Had a great time even though storms and extremely high tides prevented access to the beach. A really good view of the beach and ocean was available from our room. 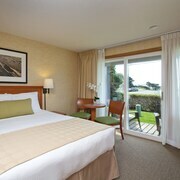 We really enjoyed our stay there earlier this week. NEW Listing! 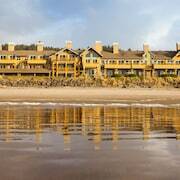 Cozy, Dog-friendly Condo w/ a Full Kitchen & Nearby Beach Access! 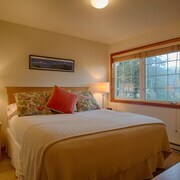 Beautiful Brand NEW Cottage Just Steps From the Beach and a Short Walk to Town!